Kia has showcased its latest hybrid concept at the Frankfurt Motor Show. The Niro was created at the company’s Frankfurt design studios by Kia’s chief European designer Gregory Guillaume and features a turbocharged 1.6-litre petrol engine coupled to a hybrid powertrain. 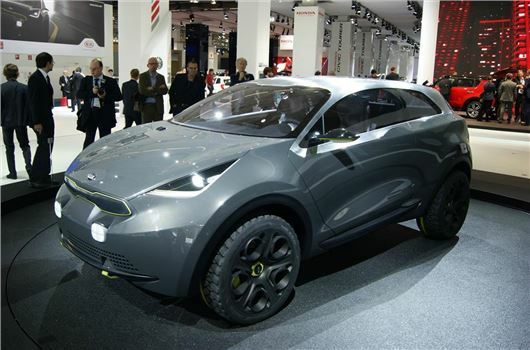 As yet, there’s no indication if the Niro will ever make it to production, but Kia tell us the car’s design is being used as a benchmark to assess customer response in order to help design future vehicles. Featuring scissor doors, LED lights and a stainless steel roof, the three-door Niro could become Kia’s rival to the Nissan Juke and is based on an all-new platform. The 160PS engine powers the front wheels and is coupled to a seven-speed, dual-clutch transmissions. The hybrid system - which is powered from regenerative braking - delivers up to 45PS to the rear wheels when road conditions require extra grip. The interior is identical to the one-piece moulded front seats seen in Provo concept, which was shown at the Geneva Motor Show earlier in the year, although the Nero features ‘clam-shell’ seat-backs tilt to allow access to a two-seat 50/50 split bench.